Last weekend, I had a memorable day of birding near the Pacific port town of Puntarenas. 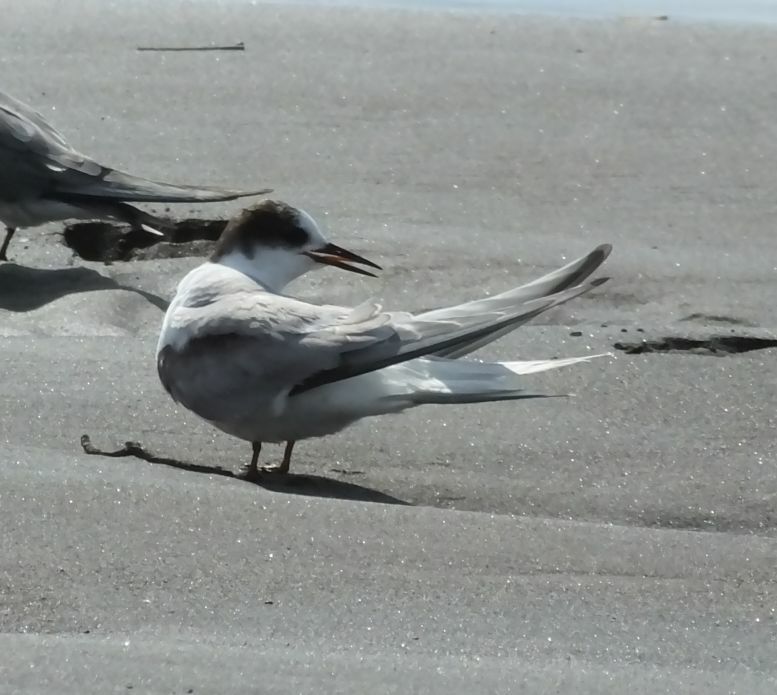 The high point was a much awaited lifer in the form of Arctic Tern (a pretty rare bird in Costa Rica, this year some have shown up on the Pacific coast). If there was a low point, I suppose it was the heat but even that wasn’t so bad. 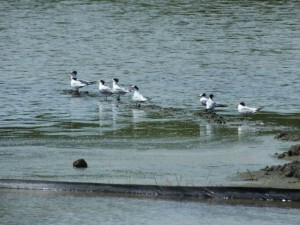 Although many of the birds we look for in that area are migrant terns, shorebirds, and other species seen in the USA, the dry habitats, open fields, and mangroves always turn up a bunch of other resident species. 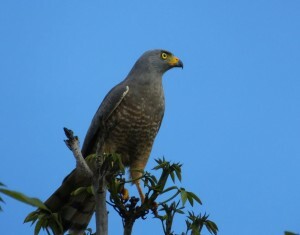 Roadside Hawk is one of the nice resident species. 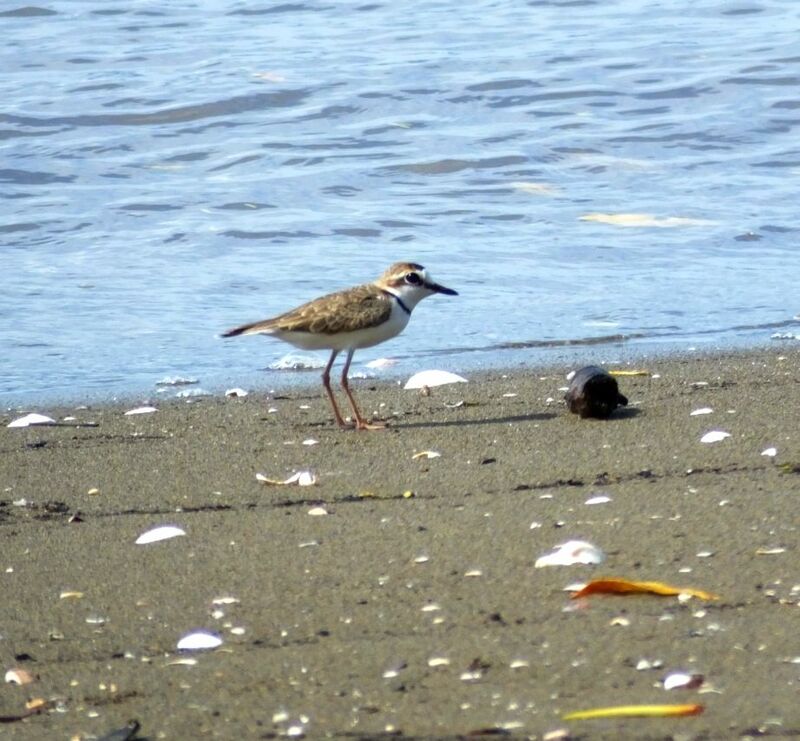 High tide is a must: During low tide, a couple thousand shorebirds, terns, and other waterbirds forage far and wide on giant mud flats in the Gulf of Nicoya. 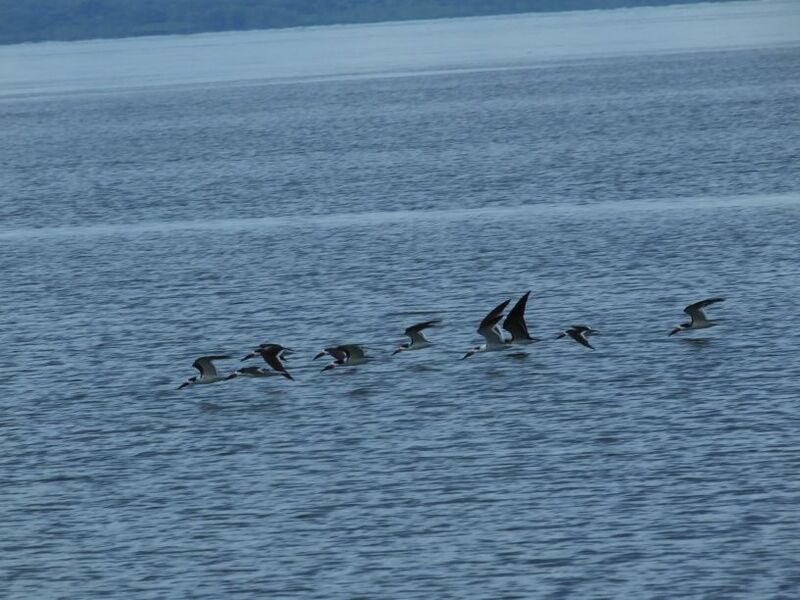 This translates to most of the birds being distant silhouettes or in some inaccessible corner of the gulf. When that open muddy land disappears, they move into the shrimp ponds and salt ponds at Chomes, and other sites adjacent to the coast. A Baird's Sandpiper turned out to be the first bird we scoped! It was hanging out with dozens of Western sandpipers, a few Semi Sands, Leasts, some Short-billed Dowitchers, a few Willets, Semi Plovers and Wilson's Plovers, and so on. Can you find it? Watch the birds fly into the gulf: Since high tide was pretty early (and we birded en route), we were witness to the low tide exodus of birds from Chomes and Morales. Although we couldn’t get good looks at most because they flew by in fast motion flocks, often zipping overhead, the experience was nevertheless spectacular. This happened while we were checking out the beach as flocks of hundreds of shorebirds suddenly appeared without warning. 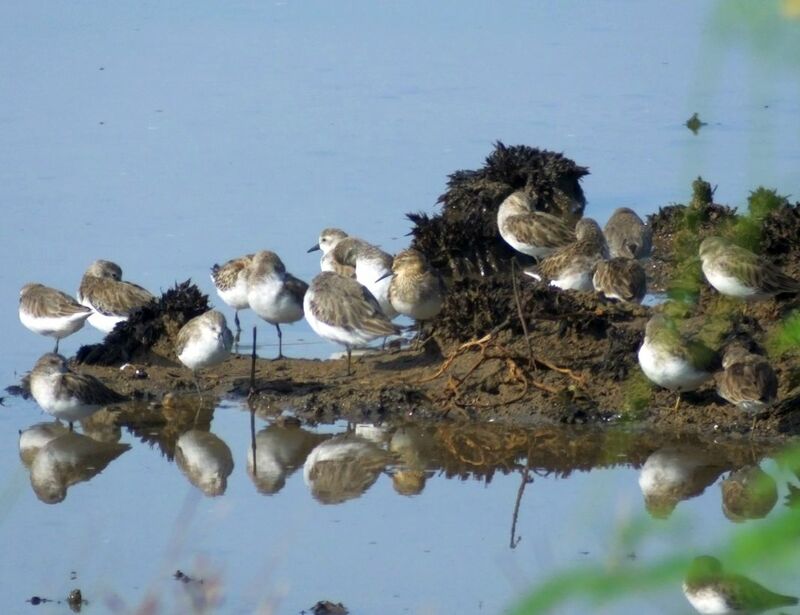 Most that we could identify seemed to be Semipalmated Plovers, Western and other small sandpipers, Black-bellied Plovers, and several Willets, Whimbrels, and Marbled Godwits. 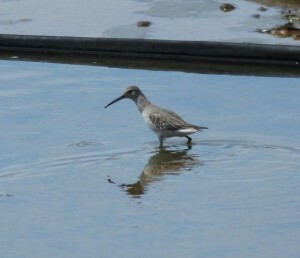 The most interesting species were American Oystercatchers, and three Long-billed Curlews. 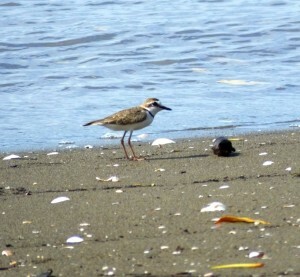 and saw the usual Collared Plovers on the beach. 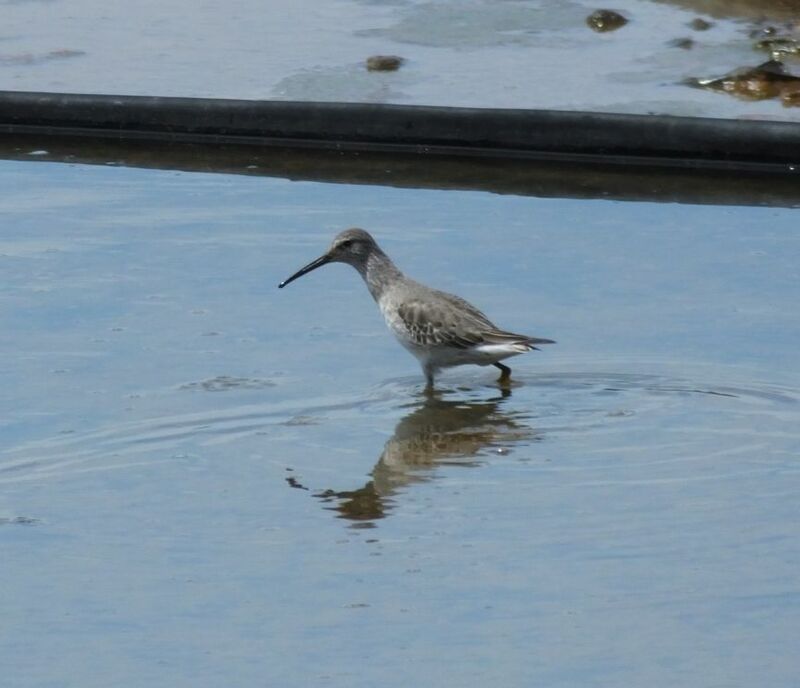 Check the short mangroves for Mangrove Rail: This former Clapper Rail lurks in thick, scrubby Black Mangroves. Get there early, scan the edges of this habitat, and you might see one. 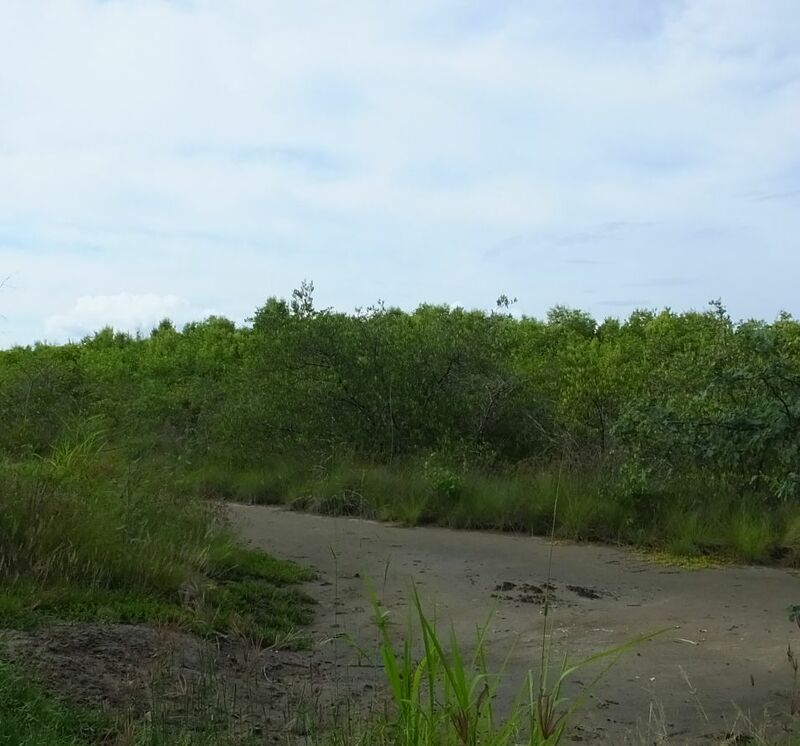 We also saw a few Painted Buntings in these scrubby mangroves. Check the grass for Tricolored Munias: Do this if you feel like ticking this Asian species for Costa Rica. 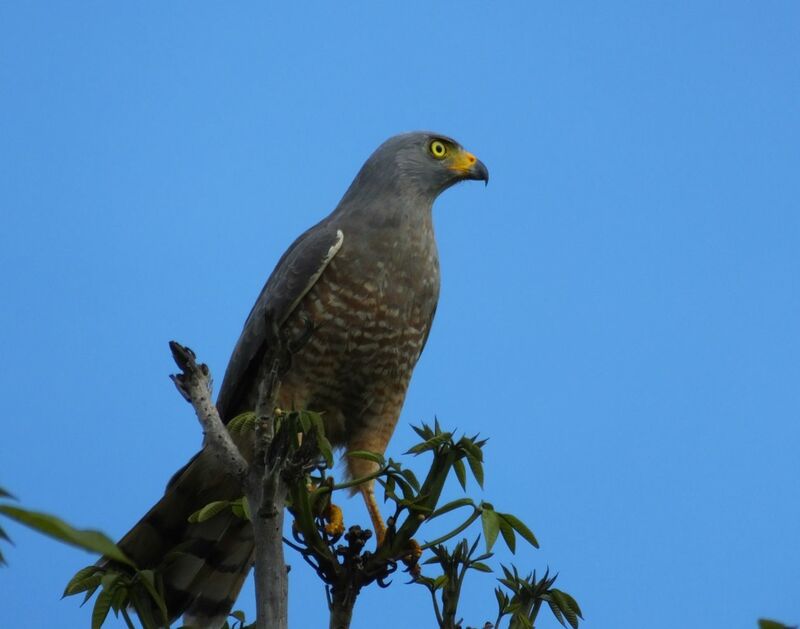 You might also see Dickcissel, White-collared Seedeater, and other grass birds. Check the tall mangroves for the specialties: Try a pygmy-owl whistle to bring up Panama Flycatcher, Northern Scrub Flycatcher, and maybe even Mangrove Hummingbird. Mangrove Vireo, Mangrove Cuckoo, and Rufous-necked Wood-Rail also occur. Scan the fields on the way in to Chomes: The huge, bare fields often have Double-striped Thick-Knee, and can turn up Harris’s Hawk and other raptors (like vagrant Aplomado Falcon). Try the Lagarto Road: This birdy road connects Chomes with the road to Puerto Morales. It has pot holes and you eventually have to ford a river but for most of the year, the river is pretty low. It also passes by a few salt ponds, and runs through a constant grove of tall shade trees that host family after family of Howler Monkeys. Those trees are also home to various dry forest species including Banded Wren, orioles, and White-lored Gnatcatcher. 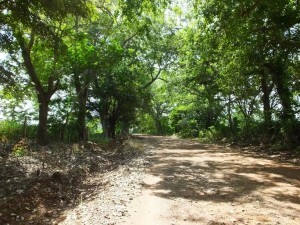 To reach this road, go to the northern corner of Chomes village, and follow the road north that goes past the cemetery. Note the nice shade trees. Turn left at the sign that says “camarones frescos”: On the way in to Puerto Morales, watch for a small sign on the right for “camarones frescos”. Turn left to go in and check out some salt ponds. 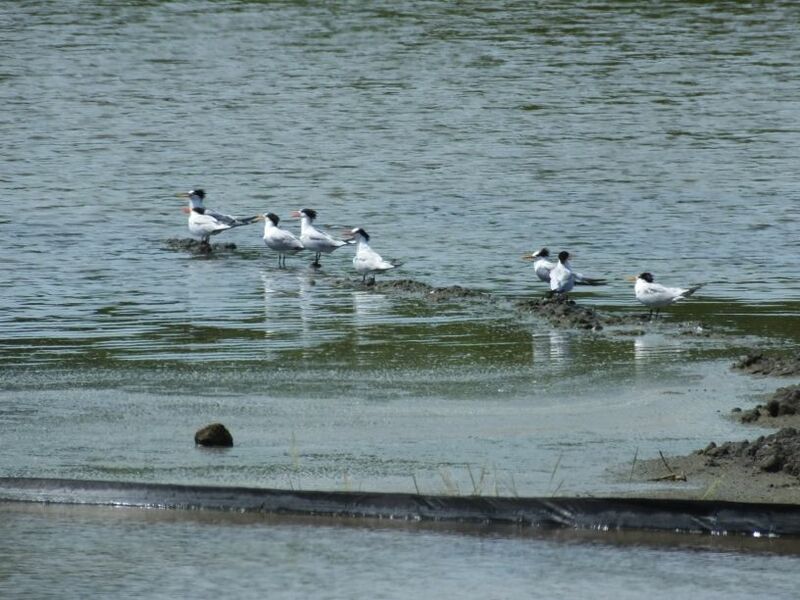 Although we didn't find the avocet that everyone else has been seeing, we did see this bunch of Elegant Terns and a few other species. Take the road at the bus stop: After checking those salt ponds, go back to the main road, and head back north for a short ways until you see a blue bus stop on the right. Take a right and drive on in to other salt ponds. Hit these at high tide and they can be filled with birds. 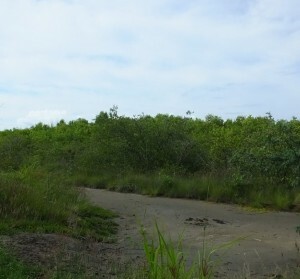 The mangroves and scrubby habitats also host resident dry forest species. At low tide, most of the birds were gone, but we still got this and 24 other Stilt Sandpipers, and a few Wilson's Phalaropes. 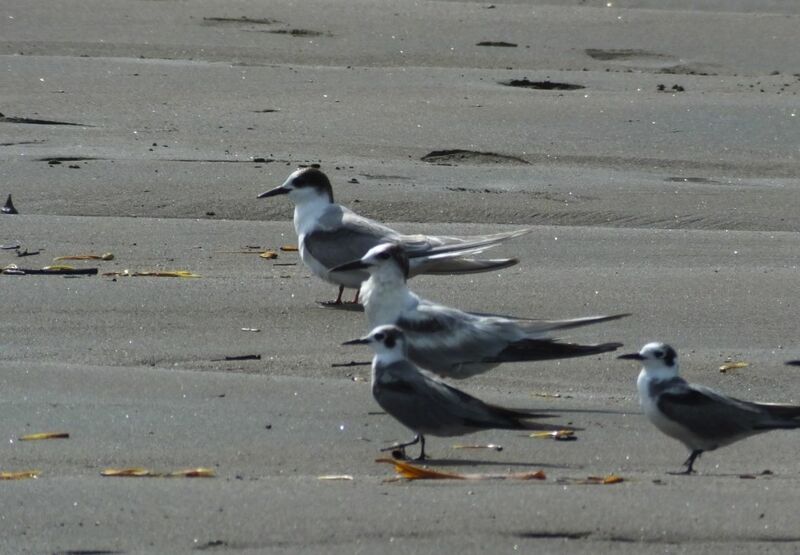 Seabirding at the lighthouse in Puntarenas: If you feel like scoping for seabirds, this is the place to do it. Drive all the long way in to the end of Puntarenas and park near the lighthouse. Go to one of the overlooks and scope the water. Morning and late afternoon are best but I have even seen storm-petrels during the middle of the day. 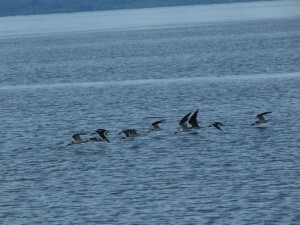 Birds tend to come closer to shore at this bottleneck between the outer and inner Gulf of Nicoya. On Sunday, things were pretty quiet but I still managed one Black Storm-Petrel, a few Franklin’s Gulls, and a probable Sabine’s. Unfortunately, that probable sat on the water a half mile away and refused to fly. Just before it went down to the water, I was pretty sure that I saw the distinctive white pattern on its wings BUT it was just too far off to identify the bird from a glimpse. Check the beach at Caldera: Especially these days! The mouth of the small river is where Arctic Tern has been seen and thank goodness, it was still there on Sunday! In fact, we saw two along with Common Terns, and Black Terns. We were favored with excellent close looks and direct comparisons with the Commons. Now that’s how you want to see a lifer! I guess you should also bring plenty of water, stay cool, and deal with the mosquitoes in whichever way works best (excepting the use of a flamethrower). @Not nearly as bad as one might think, perhaps because of frequent breezes. Some are there but you just need a bit of repellent.